Alan Reid, The Gesture That Broke the Band (2008). We can’t say that we ever really paid Scrubs that much attention. It’s not that we have anything against the show, per se, it’s just that we always found ourselves doing something other than watching it when 9 p.m. rolled around each Thursday for the last seven years (Garden State didn’t help matters much, either). Sure, we’ve caught the occasional episode in syndication over the years, but we certainly didn’t shed any tears in our beer when the show was unceremoniously dumped by NBC after last year’s crippling WGA strike. However, as Brian Stelter of the New York Times reports, the show always had a suitor who was willing to play Dr. Frankenstein and attempt to pump new life into a show suffering from rigor mortis: ABC Entertainment president Steve McPherson. While ABC has been fairly successful attracting audiences to dramas (Lost, Grey’s Anatomy, Desperate Housewives), the network hasn’t been able to establish a comedy beachfront for years (though we do give them partial credit for green-lighting Cavemen). So when Scrubs became available last spring, head ABC honcho Steve McPherson snapped up the series — a series which, not so coincidentally, he originally developed (and possibly still has a financial stake in) — and gave it new life. 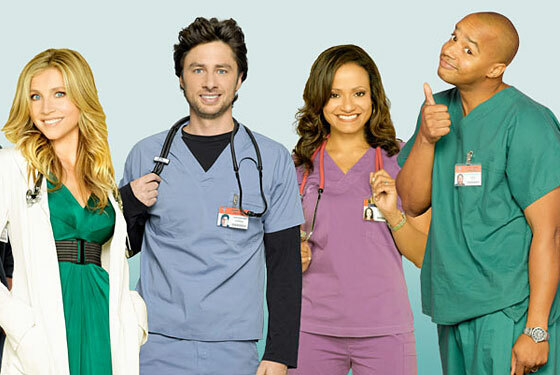 All of the principals of the show will be returning for the eighteen-episode run of the show’s eighth season, though both Zach Braff and series creator Bill Lawrence have stated that this will be their final season regardless of whether ABC picks up the show for next fall. It remains to be seen if viewers will be able to find the show when it begins airing on January 6 now that it has changed networks, but there is one thing of which we’re certain: When 9 p.m. rolls around on Tuesday nights this winter, we’ll probably find ourselves doing something other than watching Scrubs.